Introducing Popmoney® Personal Payment Service—a new part of Online Bill Pay. 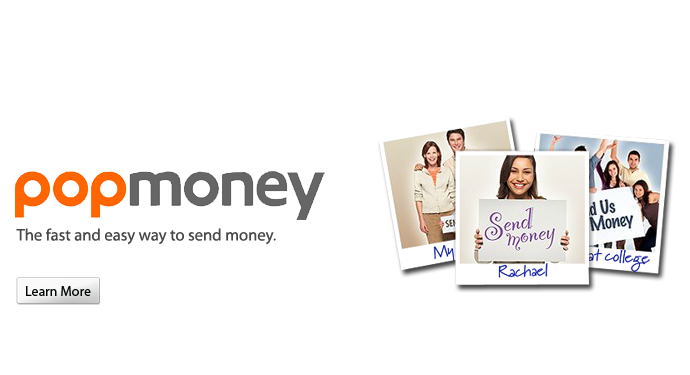 Meet our latest addition: Popmoney personal payment service, the fast way to send, receive or request money at any time. So quick and easy, you can pay back your best friend for the best burger in town or send her a request to pay you back! And because Popmoney personal payment service is part of Online Bill Pay, sending money has never been more secure or convenient—just login using your existing online password. The money goes directly from your bank account into their account usually within one business day, regardless of where they bank. Already enrolled in Online Bill Pay? Then it’s easy to use Popmoney personal payment service.